Looking for bourbon barrel aged stouts this Saturday March 2nd? Here are two ways to get your fix. Hardywood celebrates the release of their barrel aged Sidamo Coffee Stout with a bottle-only sale in the morning followed by tasting room opening for bottles, draft, and food vendors at 2pm. and an acoustic evening of Exebelle and the Rusted Cavalcade! Hardywood will be open 10AM – Noon Saturday morning for a pre-sale event for bottles and merchandise. If you’re looking to skip the lines before tasting room hours start at 2PM, this is when you want to be at the brewery. Tasting room hours will be open from 2 – 9PM with Bourbon Sidamo Coffee Stout available in half or full pints with most likely a special randall. Exebelle and the Rusted Cavalcade will play acoustic sets starting at 5:30pm. Food vendors for the night will be Monique’s Crepes, Estes BarBQue, and Station 2. Take the scenic drive up to Starr Hill in Crozet, VA as they kick off their month-long celebration of ROCK MS. 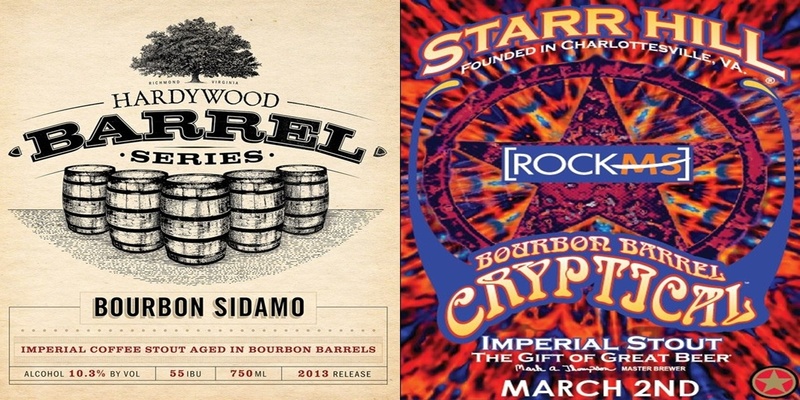 They will be having a special tapping of their rare Bourbon Barrel Cryptical Imperial Stout in their tasting room. While bottles will be made available at a later date, tastings, pints and growler fills will be available. Sign up to stake your claim for special Bourbon Barrel Cryptical bottles from their super limited run of this extremely rare brew. Local food truck favorites Delicious George and The Lunchbox will be serving grub. If you have what it takes you compete in a fierce corn hole tournament for VIP tickets to ROCK MS, Starr Hill merchandise and more. Come for the afternoon to sample and sip on this limited-edition extraordinary brew. This Saturday marks the first of many community events surrounding Starr Hill’s fundraising efforts for the National MS Society Blue Ridge Chapter and the James Q. Miller MS Clinic at UVA. The main event, ROCK MS will be held at the Jefferson Theater on Saturday, April 13th featuring the soul legend Charles Bradley.